LAS CRUCES >> New Mexico Gov. Susana Martinez rolled out the welcome wagon for a new business Monday as Franco Whole Foods announced the opening of a new food processing center that will bring 160 new jobs to Las Cruces. “As we continue to work to diversify and grow New Mexico’s private sector economy, we are proud to welcome California-based Franco Whole Foods to Las Cruces,” Martinez said. “Results like this show that diversifying our economy by competing for jobs and attracting new businesses pays off for our families and communities. Franco Whole Foods is based in San Diego, Calif., and has outgrown its facilities there, prompting the move to Las Cruces, said Mike Franco, company vice president. The Las Cruces facility will produce uncooked tortillas in varieties ranging from flour and corn to whole wheat. The process is unique, producing tortillas that have a shelf life of 90 days. The raw tortillas will be shipped from the Las Cruces factory to stores across the nation for sale. The business also caters to aficionados of Indian food, offering uncooked roti and phulka for that dining niche. Franco and his brother, Gus Franco, the president of the company, said the San Diego facility was shipping some 650,000 packages of tortillas per month. The need to increase production and have better access to shipping corridors in the Southwest and states farther east made Las Cruces a natural pick. They also plan to offer organic tortillas in the future. And, they’ve already been in discussions to expand the Las Cruces facility at 875 W. Amador Ave.
An added bonus is that the Francos have family roots here in the Mesilla Valley. The location did not come easy. It took the work of the city, state and the Mesilla Valley Economic Development Alliance to bring the project to fruition. 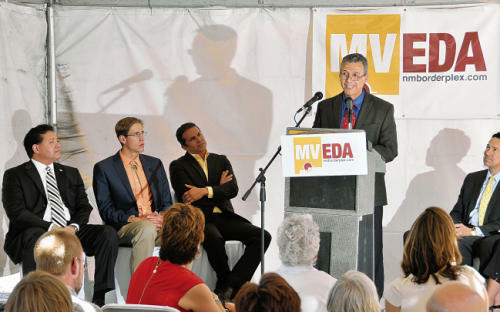 Davin Lopez, president and CEO of MVEDA, praised the collaboration and welcomed the business and what he said would be well-paying jobs. “This will be a vibrant, grade-A food processing facility,” he said. “You might think this company came and immediately found the perfect facility. That is not so.” The city, state and private banks all played a vital role in luring the business to Las Cruces, he said. Las Cruces Mayor Ken Miyagishima, whose first job was working at Taco Bell, believes Franco Whole Foods will have a perfectly trained work force when they begin to hire.